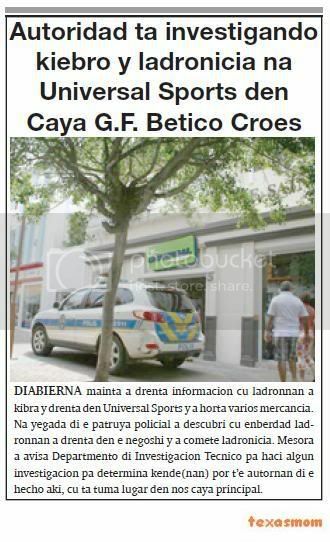 diahuebs morning owing to enter informacion cu in pitastraat have one thief cu owing to break window of car. at arrival of the patrol policial owing to come constata cu thief owing to break window of one car for enter steal in dje. besides one witness owing to declara cu past owing to look at one person descend for of one car berde y after owing to bay break the window. the agentenan attentive did take notice of all detaye y owing to leave bay straight n’e den in ranchostraat y bingo. 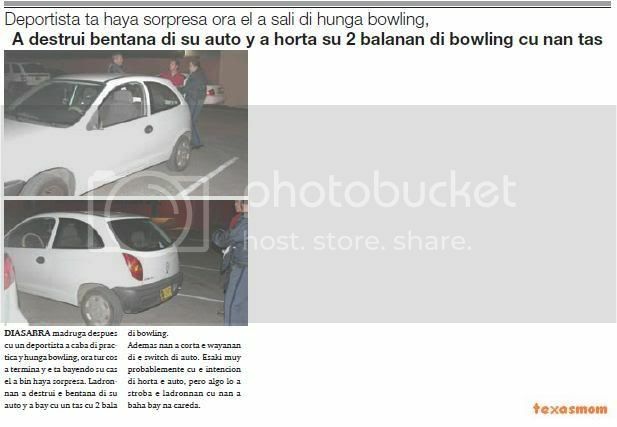 eynan they owing to come across cu the car berde y at once owing to detene the sospechoso that is one conocido of police y owing to confisca the car because; also the articulonan cu had in the car for more investigacion. then here can comproba cu if people help we can protege we comunidad mihor. diabierna morning one empleada owing to arrive at his trabao y staciona his car as custumber, but afternoon hour past owing to bay leave for take his break y busca his yiunan at school, past owing to descubri cu his car owing to being destrui. the car here is stop in becindad of the shelter roof on cabez at beach. hour past owing to arrive close y open the car past owing to descubri cu ladronnan owing to destrui the dashboard of the car y owing to bay cu the radio cd. police owing to being avisa of the caso here y owing to present for work one raport of the sucedido. diabierna morning owing to enter informacion cu ladronnan owing to break y enter in universal sports y owing to steal several mercancia. at arrival of the patrol policial owing to descubri cu enberdad ladronnan owing to enter in the business y owing to comete ladronicia. at once owing to avisa departmento of investigacion tecnico for haci some investigacion for determina kende(nan) can t’e autornan of the mature here, cu is take lugar in we caya principal. asistencia of police owing to wordo ask diahuebs 23.33 night, at sasha oasis, for one action. n’e sitio police is talk cu he g.h. naci at aruba of 32 year, that is tell police cu past owing to achieve problem cu some man. according g.h. is follow tell police cu past owing to achieve problem cu some man n’e sitio, y one discusion cu he h.t. the is tell cu h.t. owing to as at his throat, for one another man maltrate. police owing to talk cu g.h. y owing to bise p’e bay cas. hour cu the is bayendo his cas, past owing to menasa h.t. fast police. for 22.50 of night, asistencia of police owing to go back wordo ask n’e same establecimento, where will have one action cu machete y g.h.a go back. hour cu police owing to arrive owing to resulta cu not had machete, but cu g.h. owing to strike h.t. one fist in his cara. by of esey h.t. owing to cay y owing to chop his cabes part behind serious. ambulance owing to come n’e sitio y owing to transporta h.t.pa poli for tratamento, while cu police owing to detene g.h. for drunkenness y maltrato. after owing to enter informacion cu h.t. owing to stay interna for remark. yesterday we owing to achieve the relato oficial of police of one articulo cu we owing to publica yesterday end, where police owing to place hand on one thief, cu is break in car for steal y cu they owing to achieve in ranchostraat. 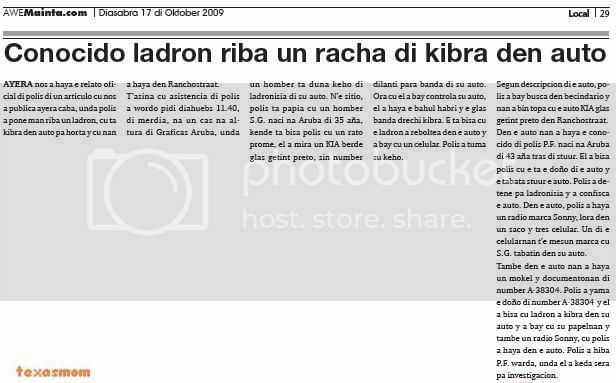 t’asina cu asistencia of police owing to wordo ask diahuebs 11.40, of afternoon, at one cas at height of graficas aruba, where one man is give complaint of ladronisia of his car. 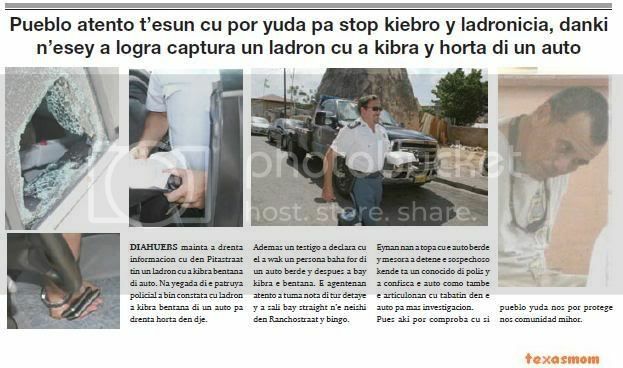 n’e sitio, police is talk cu one man s.g. naci at aruba of 35 year, that is tell police cu one rato first, past owing to see one kia berde glass getint black, without number fast stop near of his car. hour cu past owing to bay controla his car, past owing to achieve the bahul open y the glass near right break. the is tell cu the thief owing to reboltea in the car y owing to bay cu one celular. police did take his complaint. according descripcion of the car, police owing to bay busca in becindario y they owing to come come across cu the car kia glass getint black in ranchostraat. in the car they owing to achieve the conocido of police therefore.f. naci at aruba of 43 year behind stuur. past owing to tell police cu the is the owner of the car y the was stuur the car. police owing to detene for ladronisia y owing to confisca the car. in the car, police owing to achieve one radio mark sonny, lora in one saco y three celular. one of the celularnan t’e same mark cu s.g. had in his car. also in the car they owing to achieve one mokel y documentonan of number a-38304. police owing to calling the owner of number a-38304 y past owing to tell cu thief owing to break in his car y owing to bay cu his papelnan y also one radio sonny, cu police owing to achieve in the car. police owing to take away therefore.f. keep, where past owing to stay close for investigacion. guardacosta of antiyas y aruba, in one accion combina cu seccion crimen organisa, (sgc), saturday ultimo during one patruye, owing to intercepta 50 kilo of drugs, cu was abordo of one canoa. they owing to detene the person cu was maneha the canoa here. the accion here did take lugar saturday madruga early, near of 3 or of madruga, hour cu one patruye cu the superrhib of guardacosta, did take notice of one person on one canoa or also can is one kayak, was very sospechoso is actuate at entrance of bahia of barcadera. they owing to ask about they self, is kico one person is haci cu his canoa the hour of god on sea. abordo of the canoa had one sun person.e superrhib owing to bay in his direccion for haci one investigacion y so they owing to come achieve the bulto conteniendo drugs.e drugs y the canoa owing to stay confisca, while cu owing to detene the manehador of the canoa y owing to pas’e for sgc for more investigacion.mester tell cu during all the operación here, personal of guardacosta owing to ask police for controla autonan cu is stop at costa. several patrol policial owing to controla, y owing to controla some car, but not owing to come across cu nothing odd.kier mean, esnan cu was wait for the person here cu his canoa, will owing to descend at water hour owing to feel the cayente. ORANGE CITY - Off the coast of Barcadera is Saturday in the early morning intercepted a boat with about 50 pounds narcotics on board. It is the driver arrested. The Coast Guard reported. The arrest happened in a joint action by the Coast Guard and the Organized Crime Section (SGC). Around three hours in the morning during a patrol in a patrol vessel SuperRhib a suspicious man aboard a canoe discovered. The canoe was at that moment at the entrance of Barcadera bay. On closer examination were found three bales around 50 kilos drugs: two with a cocaine and marijuana. The man was arrested and the drugs were transferred to SGC. The matter is further investigated. diadomingo morning early, owing to enter informacion of one caso of maltrato pisa in one cas at dadelstraat. at once owing to dirigi police because; ambulance n’e sitio. 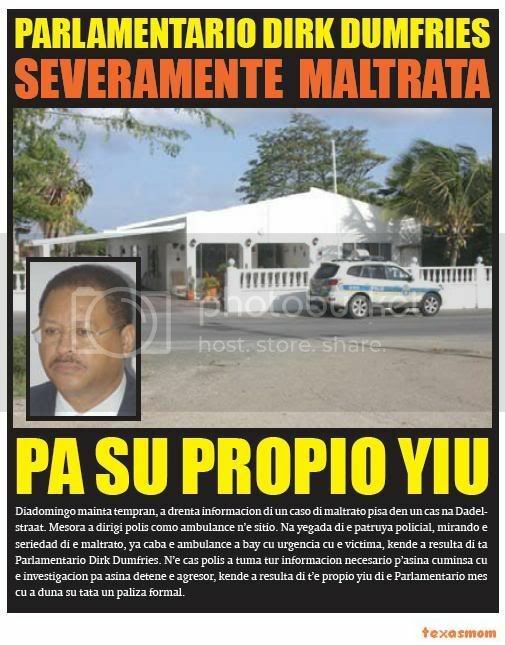 at arrival of the patrol policial, mirando the seriedad of the maltrato, already end the ambulance owing to bay cu urgencia cu the victima, that owing to resulta of is member of parliament dirk dumfries. n’e cas police did take all informacion necesario p’asina cuminsa cu the investigacion for so detene the aggressor, that owing to resulta of t’e own child of the member of parliament self cu owing to give his father one paliza serious. ORANGE CITY - The Statenlid Dirk Dumfries (MEP) yesterday reported to his son for assault. Agents were yesterday morning to the house of the parliament convened in Dakota. In Dumfries told the agents that there had been disagreement between him and his son. He therefore had the assistance of the authorities. The lawmaker was wounded in the fighting and was treated on site by ambulance staff. The reason for the abuse is not known. Dumfries has however reported to his son. one news much earnest y preocupante owing to come fast in end of week here caminda cu aruba once more is in luz negative, where cu can wordo deduci cu deal (benta) of person will can is drentando we island.t’asina cu informacion owing to enter cu one child muher of barely 2 month of edad owing to wordo rescata for funcionarionan of police cientifico pregnant falcon, venezuela.e baby owing to wordo secuestra diabierna happen at maracaibo cu intencionnan of wordo bendi for 18 thousand bolivar strong. the baby will owing to wordo tresi aruba after of wordo bendi by of the own aunt y cousin of the mother. one news much earnest y preocupante owing to come fast in end of week here caminda cu aruba once more is in luz negative, where cu can wordo deduci cu deal (benta) of person will can is drentando we island. t’asina cu informacion owing to enter cu one child muher of barely 2 month of edad owing to wordo rescata for funcionarionan of police cientifico pregnant falcon, venezuela. the baby owing to wordo secuestra diabierna happen at maracaibo cu intencionnan of wordo bendi for 18 thousand bolivar strong. the baby will owing to wordo tresi aruba after of wordo bendi by of the own aunt y cousin of the mother. not owing to stay revela exactly if the persona(nan) cu owing to cumpra the baby is venezolano self or of another nacionalidad, but if owing to stay estableci claramente cu the baby will owing to come aruba after cu full the coin will owing to wordo pay, algo without doubt cu will have have to of more investigacion, specialmente mirando the type of crimen abysmal here. at aeropuerto internacional josefa camejo, ubica at municipio los taques of the peninsula of paraguana owing to detene 4 person, 3 of they colombiano y one venezolano cu is wordo sospecha of owing to materializa the secuestro of the baby. after of the interogatorionan, the detenidonan owing to informa the paradero of one muher conoci because; “georgina” eldrit omira curie of 38 year live in bushistraat at ponton, that will owing to secuestra the baby at maracaibo y traslade at hotel caribe at sharp fijo. in the camber of hotel owing to detene muher y owing to achieve the baby in good estado of salud. besides they owing to detene also gillianie rose- ann kock of 27 year live at sabania downstairs y cecilia curié of 54 live at hooiberg. autoridadnan at aruba will have to can haci one follow up on the caso here y evita cu in future one plan so provided that berdad wordo concretiza y cu children secuestra at another paisnan can enter we island god know cu what intencionnan of the secuestradornan or the cumpradornan. ORANGE CITY / MARACAIBO - Three Arubans by local authorities in Venezuela arrested for involvement in the selling and abduct a baby. Venezuelan media said that the Corps of criminal onderzooek (CicpC) one of just two months old baby rescued. There were a total of eight people were arrested including three Arubans. One of the suspects, an aunt of the baby, claimed last Friday that the baby would be kidnapped. She explained that at least her sister, mother of the child. She appeared to have sold the child themselves. Reportedly, there are 18,000 bolivar ($ 8373) counted down to buying the child. This was in four equal payments. The aunt of the baby sold it to an international child trafficking gang to do. The baby was on Saturday night with the baby before the suspects got on the plane by police rescued. H. said during the interrogation of the police that her husband and her daughter Melesio Riera Marifer Johaina Barrios (23) also have helped them in this case. 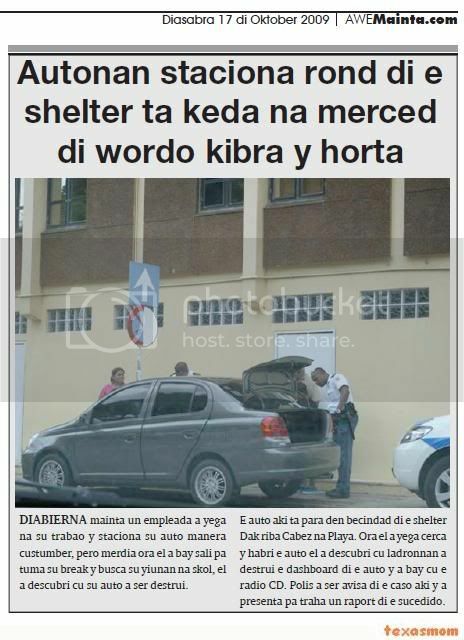 It was admitted that the steal of the baby with help from the Aruban Georgina Currie called Gina, is successful. Currie was pregnant for a while to have to occur in Aruba. Currie wore the last time just as wide clothing to her family and friends into believing that she was pregnant. Last August she was in Venezuela because they would have known pregnancy complications. By staying in the clinic in Venezuela has a debt she left behind. Currie let her know they work because of financial problems that debt. Her colleagues would have helped her financially even. Now last week she would have traveled to Venezuela to give birth to her supposed baby. The aim of Currie was therefore in Venezuela to buy a baby. She may even have paid a man to pretend he was her husband. 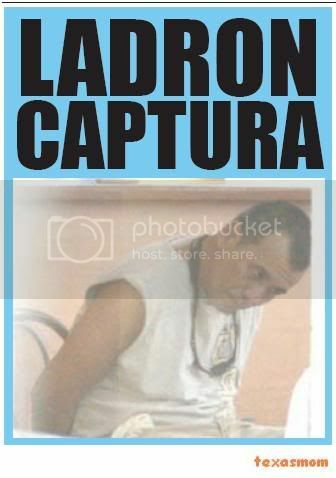 The three Arubanan including Currie and five other parties are now in jail in Venezuela. It is not known whether they have a lawyer and whether the Dutch embassy is aware of this matter. the caso penal contra jason mathilda (19) not owing to follow. this for motibo cu fiscal owing to ask for pospone tratamento of the caso already cu still is wardando on result of investigacion at the netherlands y also still the raport of psychiater do not cla. 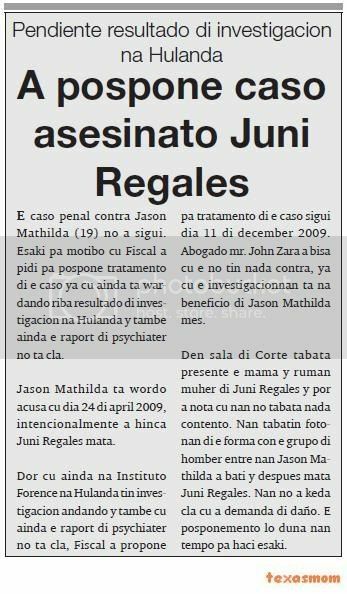 jason mathilda is wordo acusa cu day 24 of april 2009, intencionalmente owing to hinca june regales kill. by cu still at institute forence at the netherlands have investigacion andando y also cu still the raport of psychiater do not cla, fiscal owing to propone for tratamento of the caso follow day 11 of december 2009. advocate mr. john zara owing to tell cu the not have nothing contra, already cu the investigacionnan is at beneficio of jason mathilda self. in sitting-room of corte was present the mother y brother muher of june regales y can owing to notice cu they not was nothing contento. they had fotonan of the form con the are of man among they jason mathilda owing to beat y after kill june regales. they not owing to stay cla cu owing to demanda of damage. the posponemento will give they time for haci this. he t.(58) of nicaragua diabierna morning owing to hear fiscal ask for pospone tratamento of the caso. t. is wordo acusa cu entre1 january 2005 – 31 december 2007 past owing to abusa of 3 child younger of edad. also the is wordo acusa of owing to haci actonan inmoral cu the children here. fiscal owing to ask huez for pospone the caso for 27 november 9.30 of morning, because will bay interoga the children in one studio special. advocate of t., mr. schwengle is achieve cu the declaracion of the children is contradeci another. the is achieve cu have mucho some indicacion y pesey owing to ask huez for suspende the detencion of t. fiscal do not of acuerdo for let t. pound. past owing to tell cu is deal of one caso much earnest y cu if have condena t. is talk here of añas of castigo y do not see motibo valido for suspende detencion of t.
the advocate owing to tell huez cu t. owing to admiti of owing to touch cu one child only. huez owing to ask about t. if esey is berdad y t. owing to tell cu once only past owing to touch cu one of the children y nothing more. huez is achieve cu the caso is much earnest y owing to rechaza the peticion for let t. pound. past owing to pospone the caso for day 27 of november now for 9.30 of morning. 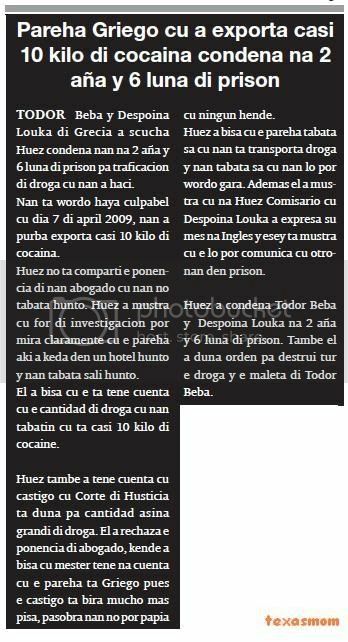 todor beba y despoina louka of grecia owing to listen huez condena they at 2 year y 6 month of jail for traficacion of drugs cu they owing to haci. they're wordo achieve culpabel cu day 7 of april 2009, they owing to try exporta casi 10 kilo of cocaina. huez do not comparti the ponencia of they advocate cu they not was together. huez owing to show cu for of investigacion can see claramente cu the pareha here owing to stay in one hotel together y they was leave together. past owing to tell cu the is as cuenta cu the cantidad of drugs cu they had cu is casi 10 kilo of cocaine. huez also owing to as cuenta cu castigo cu corte of husticia is give for cantidad so big of drugs. past owing to rechaza the ponencia of advocate, that owing to tell cu have to as at cuenta cu the pareha is greek then the castigo is become mucho more pisa, because they not can talk cu none person. huez owing to tell cu the pareha was know cu they're transporta drugs y they was know cu they will can wordo grab. besides past owing to show cu at huez comisario cu despoina louka owing to expresa his self at english y esey is show cu the will can comunica cu others in jail. 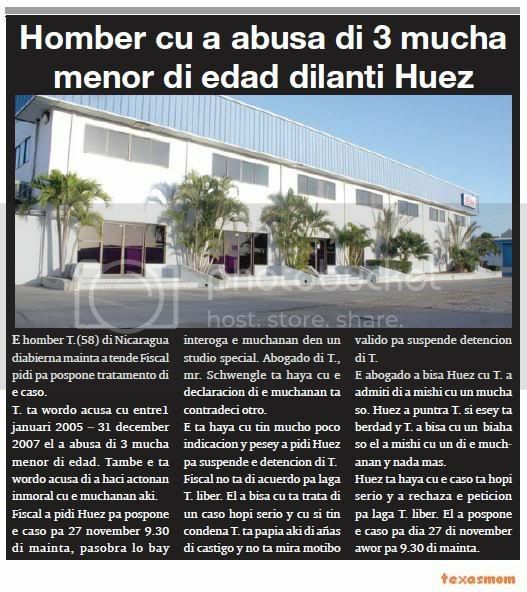 huez owing to condena todor beba y despoina louka at 2 year y 6 month of jail. also past owing to give orden for destrui all the drugs y the trunk of todor beba. saturday madruga after cu one deportista owing to end of practica y play bowling, hour all cos owing to termina y the is bayendo his cas past owing to come achieve surprise. ladronnan owing to destrui the window of his car y owing to bay cu one bag cu 2 ball of bowling. besides they owing to clip the wayanan of the switch of car. this muy probably cu the intencion of steal the car, but algo will owing to stroba the ladronnan cu they owing to descend bay at careda. testigonan owing to calling keep of police diadomingo madruga 5’or y they're tell cu have one thief in of two floor of bakery moderna because; cu the light was sendi. at once police owing to bay n’e sitio y they owing to rondona the edificio. hour cu police owing to arrive they're see cu had light in of two floor y is see one window break. police owing to see one wire of computer is colga for of the window. the thief one such g.m., that was in the lugar, owing to feel his self atrapa y owing to fly for of two floor cu one bag black in his hand. one police owing to core his slow y owing to succeed detene y owing to hibe keep. past owing to resisti pisa, but police owing to domine cu klop. in the bag black the had cable of computer y also one laptop. at keep past owing to haci enough fasioso y owing to break one window cu his schouder y his cabes. past owing to stay close for investigacion. presencia of police owing to wordo ask diabierna nightfall 5.30, at one cas in caya bohi, where one madam owing to reconoce his riemnan of car cu owing to wordo steal one month first. the riemnan was poni on one toyota tercel blanco a-43475. the madam d.k. naci at aruba of 27 year, is tell police cu desconocinan owing to steal his 4 riem of car one month first, y today past owing to see they on one car. the had recibo cu past owing to cumpra the riemnan y also past owing to show police photograph cu past owing to saca. police owing to takel the car y owing to hibe keep of police at san nicolas. one rato after the owner of the car the.m.l. naci at venezuela of 21 year owing to bay keep of police y the is tell cu past owing to cumpra the riemnan for of one such j.m. for 800 guilder. the caso is in investigacion. diabierna morning one boy of 15 year, that is trahando at one suspermercado at pos diminutive, is bay keep of police at san nicolas y is tell police cu some acolyte of the gang of sabana broom is buske for fight. the is tell cu the was trahando y the are owing to come y owing to descend for of car y owing to yame p’e come fight. after owing to descend bay for of the sitio. according the.c. owing to tell police cu past owing to bay together cu his amigonan at they cas. hour cu they was at home of his amigonan, one car toyota rav owing to come stop fast of the cas y 5 boy owing to descend cu machete in they hand y owing to invita they for fight. mother of his amigonan owing to leave pafo y owing to core cu they of his territory. they owing to bay, but owing to menasa they. according they owing to tell cu at where cu they come across cu they, they're beat they. the caso have atencion of police. ORANGE CITY - Todor Beba and Despoina Louka, Greece rid of both, his last week sentenced to 2.5 years imprisonment for drug trafficking. The pair tried on April 7, 2009 nearly ten pounds to smuggle cocaine out of the country. The defense argued that the two together would not be heard but believed that the judge not. The Public Prosecutor (OM) was in fact able to show that the two Greeks lived together in a hotel and went out together. In the sentence the court took into account the large amount of cocaine that the perpetrators wanted to smuggle them. The fact that the smugglers would speak only Greek, and therefore should receive a lesser sentence, was also swept aside by the Court. "They knew what they were getting and that they could be caught." Moreover, one of the offenders during the investigation, expressed in English. The court therefore decided to 2.5 years to pay both cell and ordered the destruction of the drug. servicio for comunidad owner of one bar restaurant at stone plat, owing to calling keep of police of santa cruz, diadomingo 00.31 y is tell they cu he the.d. naci at aruba of 35 year is enough sober in the bar y does not leave for they close they door. hour cu police owing to arrive, the self owing to leave pafo. police owing to see cu man cu is resulta of is the.d. naci at aruba of 35 year, that was enough fastioso y police owing to bay for detene. past owing to resisti his detencion y owing to fight cu the polisnan. after cu police owing to succeed domine place in boei, y owing to bay hinke in car, past owing to send skop y owing to injury one of the polisnan. police have to owing to using klop for domine y owing to hibe keep of santa cruz, at where past owing to achieve one cuarto free. one pareha anciano, cu live in caya ernesto petronia owing to calling keep of police of beach y is ask asistencia for they son choler cu is menasando they cu dead. police owing to bay cu urgencia n’e cas y they're come across cu the choler f. stop is beat at window y is bark his parents if they not dune his coin the is bay maltrata they. the was completamente hostina y police not can owing to razona cune. his parents owing to ask police for they bay cune, because; cu they have fright of dje. hour cu they owing to bay for detene past owing to resisti pisa. police owing to tell his parents for give complaint at recherche. 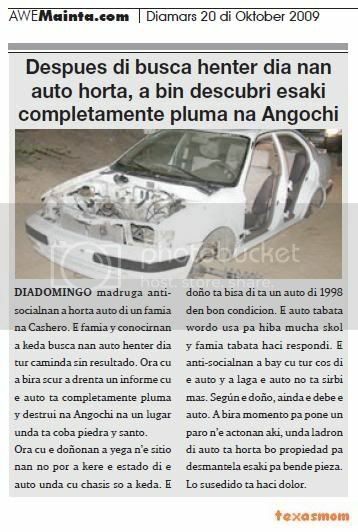 diadomingo madruga antisocialnan owing to steal car of one family at cashero. the family y conocirnan owing to stay busca they car all day all caminda without result. hour cu owing to become dark owing to enter one informe cu the car is completamente pluma y destrui at angochi at one lugar where is coba stone y sand. hour cu the doñonan owing to arrive n’e sitio they not can owing to believe the estado of the car where cu chasis only owing to stay. the owner is tell of is one car of 1998 in good condicion. the car was wordo using for take away child school y family was haci respondi. the anti-socialnan owing to bay cu all cos of the car y owing to let the car do not serve more. según the owner, still the owe the car. owing to become instant for place one paro n’e actonan here, where thief of car is steal do you property for desmantela this for sell pieza. will susedido is haci dolor. yesterday morning 3 sospechoso have to owing to present for they acto cometi fast of huez comisario. is deal here of peter fradl, that is deteni for ladronicia, gimenez martinez for atraco y l. marin for ladronicia. huez comisario owing to dicidi of prolonga they detencion, for follow cu the investigacion of they envolvimento. Page created in 7.22 seconds with 19 queries.